1 Sound Choice (certified Nest professional, recently voted Best of Houzz 2014) today announced the launch of a new website and a renewed focus on consumer interaction. Established in 2005 by Ryan Herd (CEO), 1 Sound Choice set forth the goal of eliminating their clients’ stress by creating a “Lifestyle Environment” that is simple and easy to use, allowing them to take full control and check-in using mobile applications, and providing protection with security solutions. Dedicating all effort towards becoming one of the premier Smart Home and Audio/Video companies in the Northeast, 1 Sound Choice grew more rapidly than was reflected with their online presence. Highlights of the new site include rich and engaging content, more updated photography showcasing recent client work, an ongoing blog production providing insights and recommendations on a variety of technology subjects, and a more compelling overall resource for clients, architects and builder partners. Visit the all-new 1 Sound Choice website at http://onesoundchoice.com. Winner of the 2013 CEA® Retrofit Project Platinum Award, 1 Sound Choice is a full-service automation design and integration firm to make your home “Smart.” The team at 1 Sound Choice guides their clients through all aspects of a project, from product selection to design, delivery, installation, and operating instructions. 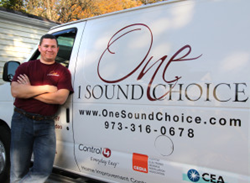 Contact the certified professionals at 1 Sound Choice by calling 973.316.0678, or visit their website at http://onesoundchoice.com. They look forward to working with you!